 Kolkata is 20 feet above mean sea level.Draining is difficult, even when rain is modest the task becomes monstrously difficult whenever intense precipitation and the high tide in the Hooghly coincide, as they did during late September.  A statement by a group of Kolkata scientists 'Waterlogging in Kolkata and Floods in South Bengal', says "the area of submergence gone up drastically. People living in places that were dry in 1978 were marooned. In Kolkata alone, nearly 2.5 million people were affected".  The city started expanding eastwards after the 1930s and in recent times expansion has been engulfing, with a slew of development projects in the pipeline ('West Bengal's wetlands under threat', Down To Earth, September 15, 2006). 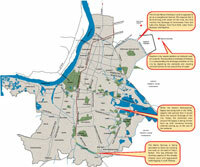 The basic development plan of the Kolkata Metropolitan Development Authority and the Perspective Plan of the City of Calcutta (1990) have been ignored to the detriment of drainage.  Calcutta's old ' khal' or canal system, which acted as an effective drainage system for some three centuries is in disrepair. Many wastewater conduits out of the city such as storm-water drains, sewers and canals are silted. Besides, gully pits are blocked and there is a time lag for water to reach the pumping stations. This leads to flooding on the surface. Poor solid waste management, along with an overburden of plastic is the culprit.  The original design of Calcutta's drainage system was was based on the drainage capacity of the sub-basins. But the unplanned diversion of surface runoff from one sub-basin to another is one of the reason for overloading of the existing drains resulting in flash floods.  In the metropolitan part of the city, the demise of small water bodies, has created problems in holding capacity of surface runoff and groundwater recharge. The filling up of ponds and marshlands to obtain real estate is linked to increased problems of drainage and flooding. Drainage system can be improved if local political &C.M herself takes interest, this problem wiil be 100% solved.